Thanks for being a follower of DrUrbanPolicy! August was a slow month for posts, in part because my AARP team has been working on a newly redesigned website for AARP's Livable Communities policies and research. 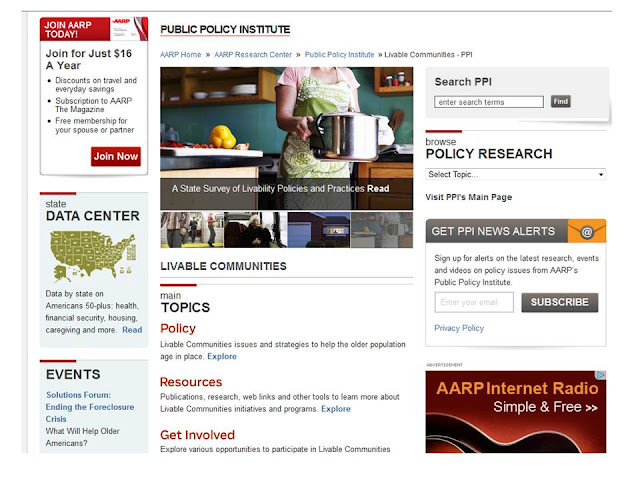 For being loyal readers of DrUrbanPolicy, I am offering you a sneak preview of the newly relaunched AARP Public Policy Institute Livable Communities Homepage - it is just finished and now on the web! Go to www.aarp.org/ppi/liv-com for policies, research and resources that can help policymakers and advocates to create communities that work for people of all ages, incomes, and physical abilities, with a special focus on improving the ability of older adults to age in place. The official announcement comes later this week, but feel free to check it out today and let me know what you think. Read below for a description of the new site. This section contains principles and policies that federal, state and local governments should follow in order to create livable communities, starting with general Livable Communities policies and focusing on the areas of Housing, Transportation and Land Use. RESOURCES This section is the heart of the site - it connects users to all of our recent reports and publications, but also contains a TOOLKIT section which takes you outside of the Livable Communities Team. There you will find connections to other parts of AARP, and a few non-AARP sources as well, including some of our research partners, and a few other things from around the web. This should serve as a source of interest for many readers. This section allows visitors to sign up for updates from the team, to request a speaker for an event, and contact information for media inquiries. If you like the AARP site, please download a few articles, and share the links with friends and colleagues (and recommend that they do the same). I hope that many of you find it interesting, so please leave any comments or suggestions below. A note: Be prepared for more AARP website news and DrUrbanPolicy blog posts later this month. Finally: Don't forget to sign up to follow DrUrbanPolicy - social media links are on the right hand side of this page and links to subscribe to the blog are below. If you have trouble, there are also links on the Who is DrUrbanPolicy page. August was a slow month, but this is going to be a busy fall - don't be left behind! Please check back often, and thanks for reading.